Yellowstone National Park was the first national park in the world, established in 1872. Yellowstone National Park is larger than the state of Delaware, with an area over 3,400 square miles (or more than two million acres). Over 95 percent of Yellowstone National Park is located in the state of Wyoming, with small parts of the park extending into Montana and Idaho. In addition to Yellowstone National Park’s historical significance, Yellowstone is known worldwide for its magnificent wildlife and the fascinating geothermal features found in the national park. Yellowstone is the largest nearly-pristine ecosystem in the northern temperate zone. Other federally managed areas within the Greater Yellowstone Ecosystem include Gallatin, Custer, Caribou-Targhee, Bridger-Teton and Shoshone National Forests, the John D. Rockefeller, Jr. Memorial Parkway, as well as the National Elk Refuge and Grand Teton National Park. With the successful reintroduction of the Northern Rocky Mountain wolf over the last twenty-five years, nearly all the original species of animals known to inhabit Yellowstone, at the time it was first discovered by adventurers from the east, can still be found in the national park today. Nearly 2,000 species of trees and other vascular plants are found in Yellowstone National Park. About 1,700 species are native to Yellow Stone National Park and another 170 species are considered to be exotic species. Wildfire is a natural part of the national park’s ecosystems, and many of the plant species found in Yellowstone have adapted to wild fires in a variety of ways. The Douglas fir, one of the eight conifer tree species found in Yellowstone, has a thick fire-resistant bark which protects the tree from most fires. The Lodgepole pine, which has cones that are only opened by the heat of fire, makes up 80 percent of the total forested areas in the national park. Forests cover 80 percent and rivers and lakes cover 5 percent of Yellowstone National Park with grasslands covering most of the remaining area of the park. The active Yellowstone Caldera, the largest super volcano in North American and the majority of the world’s active geysers are found in Yellowstone National Park. 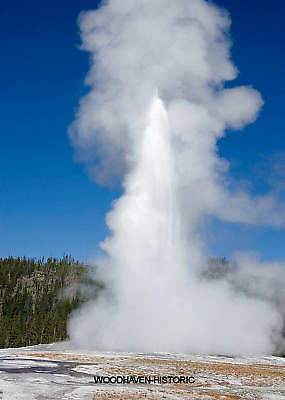 One of Yellowstone’s most famous attraction is “Old Faithful”, a well-known geyser found in this national park that erupts approximately every 91 minutes. The Continental Divide of North America runs diagonally through Yellowstone National Park. This topographic feature separates the Pacific Ocean and Atlantic Ocean water drainages. Nearly one third of Yellowstone National Park lies on the west side of the Continental Divide. The sources of the Yellowstone and Snake Rivers are near each other but on opposite sides of the divide with the result that the waters of the Snake River flow west to the Pacific Ocean, while the waters of the Yellowstone flow east and ultimately into the Atlantic Ocean by way of the Gulf of Mexico. Over hundreds of thousands of years, the Yellowstone River has carved two deep canyons, the Grand Canyon of the Yellowstone and the Black Canyon of the Yellowstone in its journey north. The Lewis River flowing south has creating the Lewis Canyon during this same time. There are nearly 300 waterfalls in Yellowstone National Park, with the highest, the Lower Falls of the Yellowstone River, being over 300 feet tall. This national park has hiking, camping, boating, fishing and sightseeing. Paved roads provide close access to the major geothermal areas as well as some of the lakes and waterfalls. During the winter, visitors often access the park by way of guided tours that use either snow coaches or snowmobiles. There are nearly 1,100 miles of hiking trails in Yellowstone National Park. Native Americans have lived in the Yellowstone region for at least 11,000 years and there are more than 1,000 archaeological sites within the national park. Yellowstone National Park also has one of the world’s largest petrified forests. In 1976, Yellowstone was designated an International Biosphere Reserve and two years later a UN World Heritage Site. Hundreds of species of animals reside in the vast forests and grasslands of Yellowstone National Park, including over 300 species of birds (see the Birds of Yellowstone National Park – Checklist) and nearly 20 species of fish. There are 10 species of amphibians and reptiles found in Yellowstone National Park. The six species of reptiles that are found in Yellowstone National Park are the prairie rattlesnake (Crotalus viridis viridis), bullsnake (Pituophis catenifer sayi), valley garter snake (Thamnophis sirtalis fitchi), wandering garter snake (Thamnophis elegans vagrans), rubber boa (Charina bottae), and sagebrush lizard (Sceloporus graciosus graciosus). There are four species of amphibians found in Yellowstone National Park, including the blotched tiger salamander (Ambystoma tigrinum melanostictum), boreal chorus frog, (Pseudacris maculata), Columbia spotted frog (Rana luteiventris), and Western toad or boreal toad (Bufo boreas). Nearly 60 species of mammals live in Yellowstone National Park, which is the largest and most famous megafauna location in the Continental United States. Grizzly bear (Ursus arctos), American black bear (Ursus americanus), cougar (Puma concolor), grey wolf (Canis lupus), moose (Alces alces), American bison (Bison bison), elk or wapiti (Cervus canadensis), bighorn sheep (Ovis Canadensis), mountain goat (Oreamnos americanus), pronghorn (Antilocapra americana), mule deer (Odocoileus hemionus), and white-tailed deer (Odocoileus virginianus), are the larger mammals found in Yellowstone National Park. Other smaller mammals found in Yellowstone National Park include the wolverine (Gulo gulo), bobcat (Lynx rufus), coyote (Canis latrans), Raccoon (Procyon lotor), American badger(Taxidea taxus), fisher (Martes pennant), American marten (Martes Americana), American mink (Neovison vison), Long-tailed Weasel (Mustela frenata), Short-tailed Weasel (Mustela ermine), North American River Otter (Lontra Canadensis), Beaver (Castor Canadensis), Muskrat (Ondatra zibethicus), North American Porcupine (Erethizon dorsatum), Striped Skunk (Mephitis mephitis), Bushy-tailed Woodrat (Neotoma cinerea), Northern Pocket Gopher (Thomomys talpoides), American Pika (Ochotona princeps), ten species of bat, six species of vole, five species of shrew, four species of rabbit, four species of squirrel, three species of chipmunk, and two species of mouse..
Yellowstone has healthy populations on most of its mammal species. Elk make up the largest population of any large mammal species in Yellowstone National Park with herds in excess of 30,000. The Yellowstone National Park has the largest public herd of American bison in the United States. The American bison population in Yellowstone National Park has increased from less than 50 in 1902 to nearly 5,000. It is believed that there are less than 1,000 moose living in Yellowstone National Park. Pronghorn are commonly found on the grasslands of Yellowstone National Park. An estimated 600 grizzly bears live in the Greater Yellowstone Ecosystem, with over half of this population living within Yellowstone National Park. The grizzly is currently listed as a threatened species. The mountain goat and big horn sheep populations in and around Yellowstone National Park are estimated to be about 200 for each species. After exterminating wolves in Yellowstone National Park during the 1920’s, Mackenzie Valley wolves (66 individuals), were imported from Canada and reintroduced into the national park during 1995 and 1996. These reintroduction efforts proved very successful and wolf population has returned to around 100 individuals in the Yellowstone National Park and about 300 in the Greater Yellowstone Ecosystem, and is remaining relatively stable. The recovery of wolf populations throughout has been so successful that in 2008, the U.S. Fish and Wildlife Service removed the Northern Rocky Mountain wolf (the subspecies of grey wolf found in Yellowstone National Park) population from the endangered species list. Some animals are still less common in the national park than they were a hundred years ago. the Canadian lynx (Lynx canadensis) has not been seen in Yellowstone since 1998, although other non-visual evidence indicates that the Canadian lynx has been at least a transient visitor to the park during recent years. Other, less commonly seen mammals include the cougar and the wolverine. There are only an estimated 25 cougars living in the Yellowstone National Park and the number of wolverine is unknown. There are also extremely rare sightings of whooping cranes in Yellowstone National Park, however only three examples of this species are known to live in the Rocky Mountains, out of less than 400 known worldwide. Other bird species of special concern because of their rarity in Yellowstone, include the common loon, harlequin duck, osprey, peregrine falcon and the trumpeter swan. On a brighter note, more than twenty pairs of nesting bald eagles have been documented within Yellowstone National Park. More about the history of Yellowstone National Park,the first national park in history. CLICK HERE to see several webcams located in Yellowstone National Park. These webcams are not continuous live streaming video, but update live view every 60 seconds.